Regular fliers are constantly looking for a way to speed through airport security. While TSA PreCheck helps move customers through the physical security check, a biometrics company is looking to get customers through the identity verification portion of security in seconds, not minutes. Clear, a New York City-based biometrics company, is rolling out biometric pods to major airports across the country–with a presence in 20 of the largest airports with close to a million customers, and growing. The Transportation Security Administration security process consists of two parts, the identify verification process–when a TSA employee checks your ID and ticket, typically with a black light and a scan of your ticket–and the physical screening–when bags are X-rayed and travelers go through the full body scanner. Clear does not replace the physical security screening. 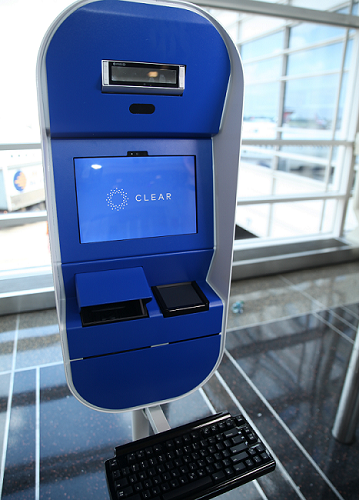 Instead travelers enrolled in Clear’s program, which costs $179 a year, bypass the identity verification line and step up to one of Clear’s biometric pods. Customers can then verify their identity through either an iris or fingerprint scan. Once they verify their identity they can either move to regular TSA physical screening or PreCheck physical screening. In order to join Clear’s program, customers have to verify their identity through Clear’s process. Cohen explains that Clear’s identity verification process consists of three parts. First, customers have to present a valid government ID. Clear uses the same hardware validating technology that the government uses to ensure that the ID is valid and appropriate. Next, a customer takes a knowledge-based quiz based on commercially available data. The text consists of very deep questions. In terms of the value proposition Clear offers its customers, Cohen believes it is the gift of time and predictability. Of course, identity security is at the forefront of every traveler’s mind, especially when handing over sensitive information such as fingerprints and iris scans. While Cohen couldn’t talk security specifics, he did say that protecting customer information and data is similarly a high priority for Clear. For airports, Cohen highlights that Clear represents a new stream of revenue, as well as a way to improve guest satisfaction. Cohen explains that Clear enters into a service or concession contract with each airport individually. Essentially, Clear is the same as any other vendor in the airport–what makes them different is the service that’s offered. According to Cohen, Clear is the only service offering a biometrics-based security service. The specific contract terms change with each airport, Cohen said, with some airports requiring Clear to rent space and others not. “In these austere times when airports are looking for new sources of revenue–this is a new source of revenue. This is an opportunity to provide a new service to customers,” Cohen said. Clear’s expansion strategy has focused on getting into the airports where fliers originate from or are flying to, but Cohen does see Clear expanding into smaller airports–if the customer base is there. Through the SAFETY Act, part of the Homeland Security Act of 2002, Clear’s biometrics technology is certified as a qualified anti-terrorism technology by the Department of Homeland Security. While Clear has a role in airport security, Cohen stresses that it doesn’t do what TSA does. 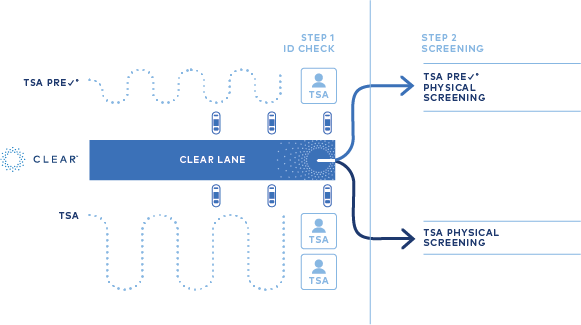 While Clear provides identity verification services, it in no way takes the place of physical screening or Secure Flight check provided by TSA. The Secure Flight program conducts watch list matching of passenger information against the Terrorist Screening Database watch list for all covered U.S. and foreign flights into, out of, and within the United States, including point-to-point international flights operated by U.S. airlines. Cohen also explains that Clear’s program is complementary to TSA’s PreCheck program and the majority of Clear’s customers are taking advantage of both programs. “At a national level about 60 percent of our fliers are using Clear and PreCheck. Some of our airports skew well over 60 percent on any given day, specifically on heavy business traveler days,” Cohen said. While Clear does work alongside TSA to keep airports safe, their relationship isn’t quite a partnership. Cohen sees the future of biometrics as unlimited. In regard to improving homeland security, both inside and outside of the airport, Cohen acknowledges the role biometrics can play.